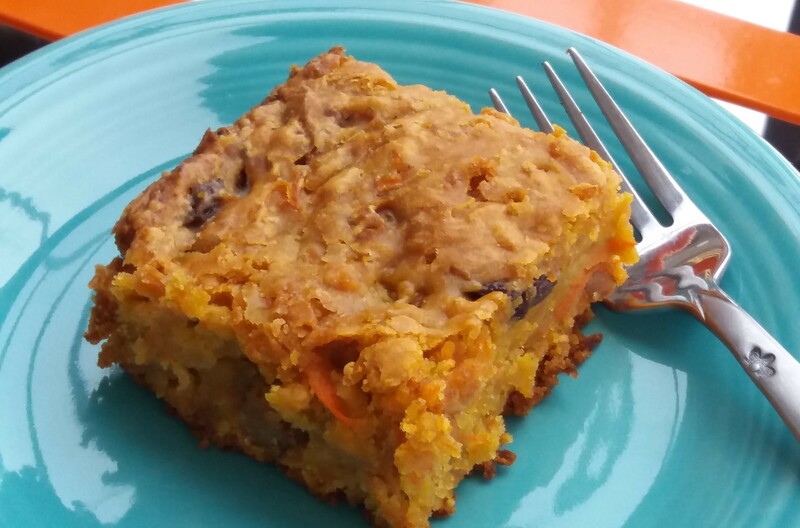 You want a delicious, moist and just-sweet-enough carrot cake? This is the one you must try! The secret to its moistness is the topping applied after baking. That fact that it is vegan is just icing on the cake! few drops umeboshi vinegar optional, but interacts with the baking powder to make this cake really rise nicely. Can substitute apple cider vinegar. Optional Modifications: For just as good result but slightly less sweet, use 1/2 cup maple syrup and 1 full cup of apple juice in the topping. Preheat oven to 375°F. Oil a square baking dish (8 or 9 inch). Place the following wet ingredients in a separate bowl: oil, apple juice, lemon zest, umeboshi vinegar, water from soaking raisins, ginger juice. Stir the dry ingredients together. Stir the wet ingredients together. Gently pour the wet ingredients into the bowl containing the dry ingredients. Mix and form the dough. Add carrots, raisins and walnuts stirring while adding to ensure ingredients are evenly spread throughout. Pour mixture into baking dish. Bake at 375 for 45 to 60 minutes. When 10 minutes left for the cake to bake, start making the topping. Combine the maple syrup, apple juice and tangerine or orange juice (if using) into a saucepan. Continuously stir while bringing to a boil. Turn down the heat and simmer for one minute. Remove cake from oven. With a toothpick, poke holes throughout the top of the cake. These holes will allow the topping to seep through when you pour it over the cake. Remove saucepan from the stove and evenly and gently pour the topping over the cake. Allow cake to sit for 10 minutes. Serve.